The plant Andrographis paniculata is a traditional herb in the Southeast Asian medicine and has been described as an important anti-inflammatory agent. Andrographolide is a major component of this plant showing effects in the central nervous system, including a reduction of oxidative stress, increased potency of the vitamin E effect. In the Morris Mice Water Maze Experiment, 10 months old APP-PS1 double transgenic mice were treated with 2.0 mg/kg/day of NeuroActin™ for 4 weeks. Mice were trained in a circular pool to locate the escape platform, with maximum trial duration 60 sec, three trials per day. The analysis of the behavioral performance showed that transgenic animals had the highest latency values (red squares), in agreement with the neurotoxic effects of Aβ. 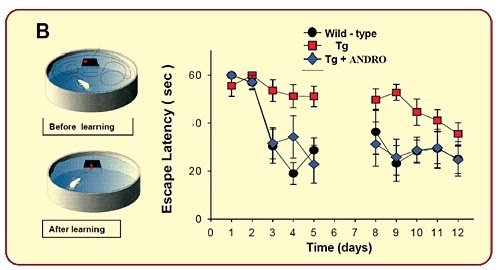 APP Transgenic mice treated with NeuroActin™ (blue rhombus) presented similar minor escape latency values as the wild type (black circle), and significantly lower escape latency values compared to untreated group (re squares0, indicating that NeuroActin™ was able to reduce the cognitive impairment on spatial memory performance induced by the high levels of Aβ. APP/PS-1 mice show higher staining for the marker of astroglial inflammatory reaction glial fibrillar acidic protein (GFAP) than wild-type animals. The perikaryon area of astrocyte cells and the astroglial GFAP intensity in the hippocampus was significantly decreased in animals treated with NeuroActin™ in comparison with untreated APP-PS1 mice, reducing them to levels similar to those of wild-type mice, suggesting that NeuroActin™ maybe effective in normalizing neuro-inflammatory status. The neurotransmitters travel across the synapse, carrying signals to other cells. Disruption to the synapses is a hallmark of AD. In the hippocampus and in the cortex of animals treated with NeuroActin™, there was a significant protection in total levels of post-synaptic proteins Shank, NR2B, GluR2 and PSD-95, while the total levels of the pre-synaptic proteins SYP and VAMP are not affected, suggesting that NeuroActin™ may be able to protect the post-synaptic protein loss. Aβ oligomers affect synaptic activity and LTP. APP/PS-1 mice showed reduced levels of the postsynaptic proteins NR2B, GluR2 and PSD-95 as compared to wild-type mice. Treatment with NeuroActin™ prevents the decrease of synaptic proteins triggered by Aβ oligomers, suggesting that it is able to protect the synaptic regions from the neurodegenerative changes of Aβ oligomers. The induction of the LTP in untreated transgenic mice was not possible due to the failure of synaptic plasticity related to the damage induced by the high amyloid burden. In the NeuroActin™ treated transgenic animals, a robust LTP was induced and maintained after 1h at a level similar to wildtype mice, suggesting that NeuroActin™ induce a strong protection and reversal of the neurodegenerative process that was triggered by Aβ structures. In addition, treatment with NeuroActin™ protects the neuronal cell loss, in the upper leaf of the dentate gyrus, indicating a neuroprotective role of NeuroActin™ in the survival of population of neurons. Glycogen synthase kinase-3βis an enzyme that regulates Wnt signaling pathway, gene transcription, and neuronal cell function. The Wnt/β-catenin signaling pathway is essential in the nervous system and participates in the neural tube formation and midbrain development. 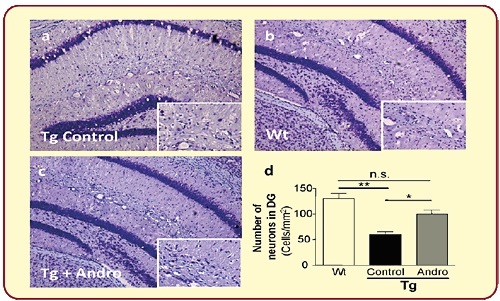 Blocked Wnt pathway caused reduced neurogenesis and impaired learning and memory function. NeuroActin™ activates Wnt signaling pathway by a mechanism that bypasses the Wnt receptor and involves inhibition of GSK-3β. In silico analyses NeuroActin™ directly inhibits GSK-3β by competing at the substrate binding site. In healthy brain, microtubules are the transport system, organized in orderly parallel strands, where food molecules, cell parts and other key materials travel. Tau protein stabilizes microtubules. Beta amyloid cause tau protein to collapse into twisted strands called tangles. When Tau protein is defective, they no longer stabilize microtubules properly. Nutrients and other essential supplies can no longer move through the cells, which eventually cause neuronal cell death. NeuroActin™ prevents tau hyperphosphorylation and significantly reduces the number of AT8-positive neurons next to amyloid deposits and in total brain. Neurogenesis is one of the processes regulated by the Wnt signaling pathway in the adult brain. In vivo research showed that treatment of 2 month-old wild-type mice treated with NeuroActin™ for 4 weeks strongly induces cell proliferation and the generation of newborn neurons in the dentate gyrus, increases density of immature neurons, increases percentage of the granular cell layer, more complex morphology, and induces development of newborn neurons.